Yes, it is true that most blogs, never better than mediocre, end up abandoned as their authors migrate over to Facebook, Twitter, Instagram, and the like. Nonetheless, there are many worthy, richly fascinating, and consistently updated blogs out there, some old, many new. Herewith, I share with you, dear reader, a my top 21 surfing faves as of this month. By the way, if at first glance Adams' blog appears pro-Trump, look again, it is not. Over the past months Adams has been analyzing and explaining some of the more esoteric techniques that Trump employs in his speeches and debates and even Tweets. Long before any of the op-ed crew in major media, Adams predicted the rise of Trump. His blog is fascinating reading, and it's worth the trouble to read many of his previous posts. And yes, this is the cartoonist who came up with Dilbert. And no, I am not for Trump. Hey, I live in Mexico. > Read my review of his latest book, Dreamland, for Literal Magazine. Read or listen to my interview with Lonn Taylor here. > Read my 2011 post about this blog here. Her Friday Link Packs are always a treat. The latest included a link to this Japanese shop and this stunning video by Method Design. Screenshot from this Vimeo video by Method Design. Rolling preacher-like thunder and, on many an occasion, wackily wicked imagery. His sci fi is not my cup of chai, but his skill and prolificacy as an essayist is a wonder. "And there are all those who, whenever I publish something that mentions climate change, crawl out of the woodwork and gnash their exoskeletal mandibles at me, to the effect that climate=weather, and it's all a conspiracy theory. They are idiots and deserve a boathook in the eye." "People were summoned to explore the heavens, they were promised universal prosperity, a world without borders, gender equality, and a third gender, and a fourth, and a fifth, and watermelons that taste like raccoons, and raccoons with the hair of mermaids. But people wanted a hug, warm tea, summers in the country, and to spend time with their relatives." TECHNO WOW, WHOA, WHAT DOES IT ALL MEAN?! This is Kevin Kelly, whose latest is The Inevitable: Understanding the Twelve Technological Forces that Will Shape Our Future). Several blogs in there, including Cool Tools. For those of you who might be wondering, my book in-progress on Far West Texas proceeds... ayyy, and having taken a karmically necessary detour to write this book review/ essay (the strangest thing I have ever written), I am still working on Marfa Mondays podcast 21. There will be blood. Of the 19th century. I invite you to listen in to the other 20 Marfa Mondays podcasts anytime here. Notes on Xavier González, "Moonlight Over the Chisos"
which goes out via mailchimp... maybe... next month. It has been a while since I posted the podcast of my super crunchy conversation with historian M.M. 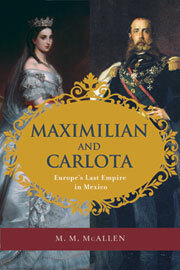 McAllen about her very fine narrative history, Maximilian and Carlota: Europe's Last Empire in Mexico. Since one of my own books, The Last Prince of the Mexican Empire, is about this same period, believe it, we got super crunchy in there. At long last the transcript is now available! If you're not familiar with Mexico's most peculiarly glamorous and hyper-complex (and very violent) transnational episode, listen in, you will learn a lot. And even if you already know about Mexico's Second Empire / French Intervention, you're in for a treat yummier than champurrado. Thanks to writer's guru Jane Friedman's wise suggestion to share transcripts of my podcasts, I have begun posting them for both my Conversations with Other Writers series and Marfa Mondays Podcasting Project. Although I do revise the transcripts, no, I don't do them myself-- if I did, I am quite sure every last brain cell would be fried like the proverbial egg on a Mexicali sidewalk! I use CLK Transcription. They do a fine and reasonably priced job, and I warmly recommend them. So when is the next conversation with another writer? Sometime in 2017, because I am at work on a book about Far West Texas. As for those Marfa Mondays podcasts, which are apropos of the Far West Texas book, stay tuned for Marfa Mondays podcast #21... I am still working on it... Podcasts 22, 23 and 24 have been scheduled and I hope to have a complete draft of the book by the end of this year. In the meantime, I invite you to listen in any time to the previous 20 Marfa Mondays podcasts. This is an ongoing occasional series. Another will be available in 2017. There will be 24 in the Marfa Mondays series; 20 have been posted to date. The 21st will be posted shortly. It goes out every other month-ish. 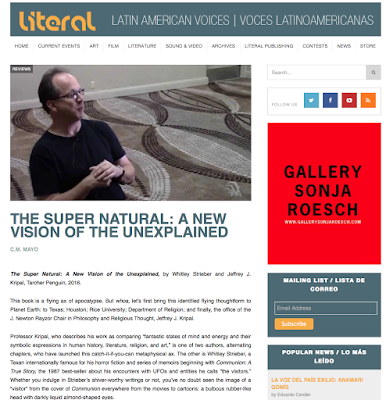 Just posted in Literal Magazine, my review of Whitley Strieber and Jeffrey J. Kripal's THE SUPER NATURAL: A NEW VISION OF THE UNEXPLAINED. It's a crunchier review than my usual 500 - 1,000 words; I went into detail about my own encounter with a mystical text, Francisco I. Madero's Manual espírita of 1911, plus brief discussion of Jeffrey Mishlove's The PK Man. This book is a flying ax of apocalypse. But whoa, let's first bring this identified flying thoughtform to Planet Earth: to Texas; Houston; Rice University; Department of Religion; and finally, the office of the J. Newton Rayzor Chair in Philosophy and Religious Thought, Jeffrey J. Kripal. Professor Kripal, who describes his work as comparing "fantastic states of mind and energy and their symbolic expressions in human history, literature, religion, and art," is one of two authors, alternating chapters, who have launched this catch-it-if-you-can metaphysical ax. 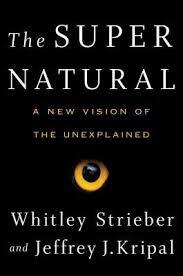 The other is Whitley Strieber, a Texan internationally famous for his horror fiction and series of memoirs beginning with Communion: A True Story, the 1987 best-seller about his encounters with UFOs and entities he calls "the visitors." Whether you indulge in Strieber's shiver-worthy writings or not, you've no doubt seen the image of a "visitor" from the cover of Communion everywhere from the movies to cartoons: a bulbous rubber-like head with darkly liquid almond-shaped eyes. If you've read this far and are tempted to stop, I urge you to take a breath—a bold breath. Should you still feel bristling hostility, as many educated readers do at the mere mention of such subjects as UFOs and "the visitors," that's normal. Soldier through the discomfort, however, and you may be able to open a door from the comfy cell of mechanistic materialism onto vast, if vertiginous vistas of reality itself—and not to the supernatural but, as Kripal and Streiber would have it, the super natural. That door does not open with a key but with what Kripal terms a cut—as provided by Immanuel Kant, that most emminent of bewigged German philosophers. More about the "Kantian cut" in a moment. Your comments are ever and always welcome. It might go out in July. Maybe again in September.